CSIL Market Research South Korea Furniture Outlook is part of the Country Furniture Outlook Series, covering at present 70 countries. 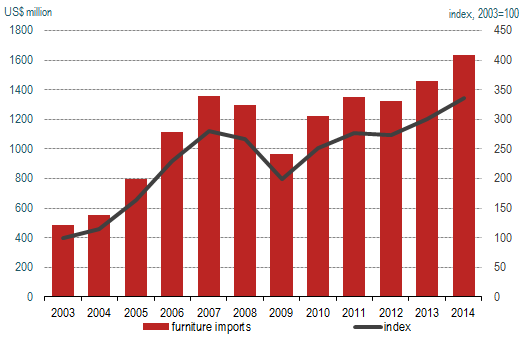 Furniture industry performance is illustrated through updated furniture statistics and through tables, graphs and illustrated maps. Information covers all the main variables necessary to analyze the industry, from the supply side (see Productive Factors – sawnwood, wood-based panels, forest resources, woodworking machinery-and Furniture Production – by segment: upholstered furniture, kitchen furniture, office furniture; by geographical regions in the country) to the market side (see Demand Determinants – population, per capita GDP, households, residential dwellings and buildings, new office buildings and international tourism), Furniture Consumption - by segment: upholstered furniture, kitchen furniture, office furniture). Future industry prospects and CSIL's assessment of market potential are also provided (see Furniture Market Potential – in terms of size of the market, performance, furniture consumer spending, market openness, import penetration) and a cross-country comparison (see Annex: Country Rankings) further enriches the analysis. Information on actors operating in the country are provided both for manufacturers and retailers (see Major Furniture Companies ) with updated company profiles, and for other industry operators (see Sector fairs, Press and Institutional Bodies).